This is a review of the product Hair Maxis. The manufacturer of this product claims that it has been formulated with the help of vital ingredients to address the common issues relating to hair and that it can provide softer, stronger, fuller, shinier, healthier and longer hair. Read on, to know more about its ingredients as well as our opinion of whether it is the right product to take for the growth of your hair. Other ingredients include Fo-Ti, Horsetail Extract, Rosemary, Flaxseed, L-Cysteine, Amla-Indian, Gooseberry extract, Aloe Vera, Ginkgo Biloba, Bhingraj, Green Tea Extract, L- Methionine, Silica, Burdock, Cellulose, Stinging Nettle, Gelatin, Saw Palmetto extract and Magnesium Stearate. It is recommended that adults take two capsules of this product daily, as a dietary supplement preferably with water or juice. The side effects of this product are quite rare as it is made up of hundred percent natural ingredients and is considered safe for long term use. However, pregnant and lactating women should only use this product after consulting with their doctor. In case of an allergic reaction to any of the ingredient in the product, you should contact a doctor immediately. The price of one bottle of this product is listed as $35 on the company’s website and includes 60 capsules which are enough to last a full month. The manufacturer also has a special offer in which you can get three bottles of this product at the price of two. The manufacturer of this product does offer a money back guarantee and states that if you are not satisfied with the product and if you don’t notice any improvement then you can return the unused bottles within 30 days and you will be provided a full refund. There are only a few reviews of this product on the company’s website which are all positive. 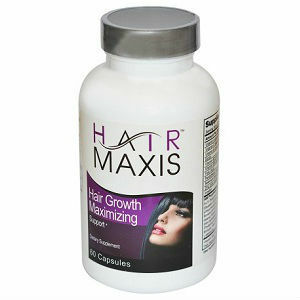 Hair Maxis is a power packed product which has been formulated by the combination of vital nutrients and vitamins. The manufacturer of this product claims that not only can it increase the growth of hair rapidly but it can also heal the damaged hairs and provide shinier, softer, longer, fuller and healthier hair. However, it is not intended to be used in any way to diagnose, cure or treat an illness or disease. Additionally, the fact that all of the reviews on the website were positive raised some red flags. John Brownstone	reviewed Hair Maxis	on July 29th	 and gave it a rating of 3.